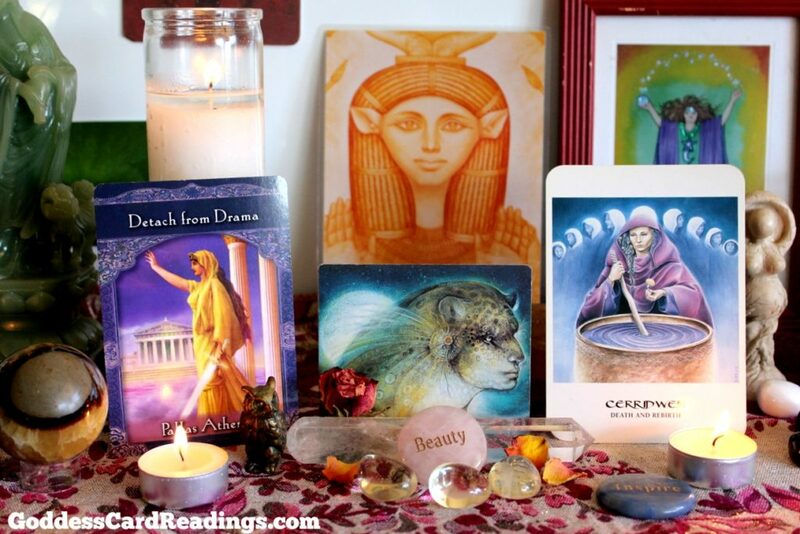 To assist us in negotiating the “buts” and “howevers” of the Full Moon this week are three Goddesses that lend their energy to mind (Pallas Athena), body (Hathor), and spirit (Cerridwen). They ensure a harmony of functionality that is required for the day to day of our lives as well as a higher level of balance and attainment. In the primary position this week is Pallas Athena, the Greek Goddess of war, strategy, and negotiation, as well as the Patron Goddess of Athens and crafts-people (such as weavers, artisans, potters, etc). She was “birthed” fully-formed from the head of her father, Zeus, and represents a more left-brained influence and approach. 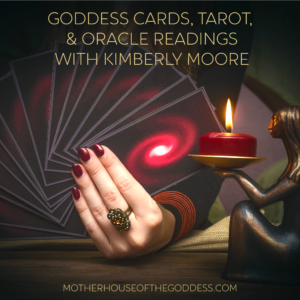 This thoughtful, grey-eyed Goddess embodies intelligence, logic, and strategy and is offering a clear view amidst some of the confusion that may appear in your week. 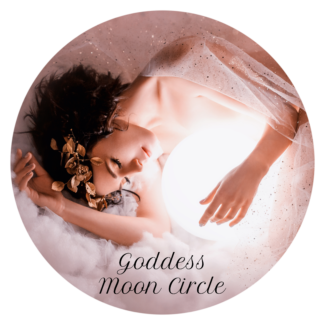 In the same way that the logical Gemini Sun balances the intuitive Sagittarius Full Moon energy, Athena balances the wild of Artemis (the Divine Archer and Huntress of the Full Moon in Sagittarius). Athena’s presence this week brings a real-world, practical opportunity for us to achieve our goals. What are the seeds that you planted at the New Moon? What are the real-world actions that are required to grow those seeds? 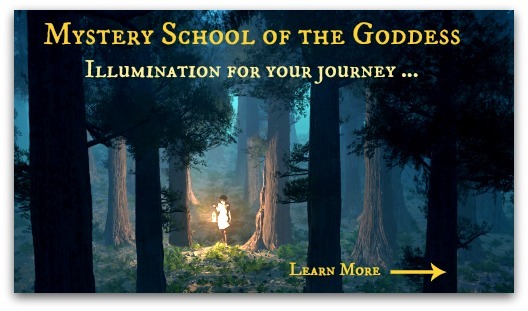 Athena is standing behind you with a head-over-heart approach to achieve manifestation. Astrologically, Neptune is squaring the Full Moon which could have the effect of detouring us from our goals or providing us with misinformation. If obstacles arise this week in furthering your plans, take a step back and look at everything with Athena’s unique brand of wisdom: intellect over emotions and a healthy dose of cleverness! Citrine is a wonderful crystal to carry for clarity of mind and as a talisman for Athena’s confidence and courage. Athena’s animal is the Owl, so look for owls as signs from the Goddess. The Lady of the House of Jubilation arrives in our week amidst a flurry of dancers, enchanting music, and sweet perfumes. The Egyptian Goddess Hathor, the Golden One, reminds us to take time for joy, beauty, and self care! Hathor’s name derives from Het-hor – The House of the Exalted One. You are the Exalted One this week and indulgence in some sumptuous self care will help to calm your mind and refresh you for the tasks required in your week. One of Hathor’s symbols is a mirror; take a peek in the mirror and ask yourself, what do I need to do to take care of my body this week? What makes me feel beautiful? The ancient scribes wrote: “How happy is s/he who contemplates Hathor”. 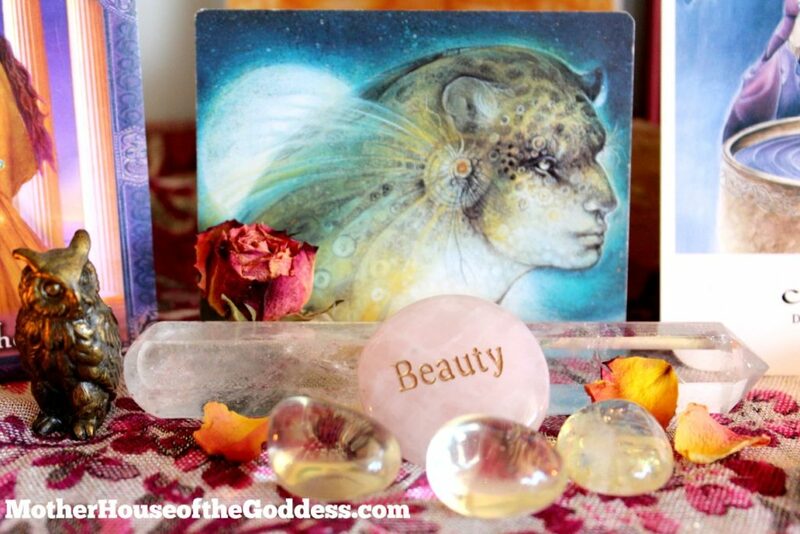 Open to the beauty, the sensuality, the happiness that Hathor is bestowing upon you! Typical offerings to the Goddess Hathor included perfumes, oils, salves, as well as the sistrum and necklaces. Malachite and Emerald are two crystals sacred to Her. 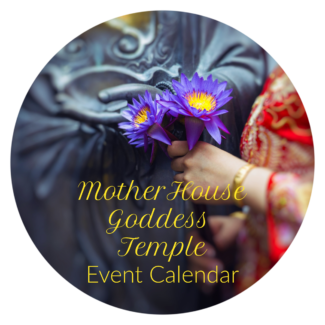 Adorn yourself, nourish your body, and then dance in gratitude to the Goddess Hathor! 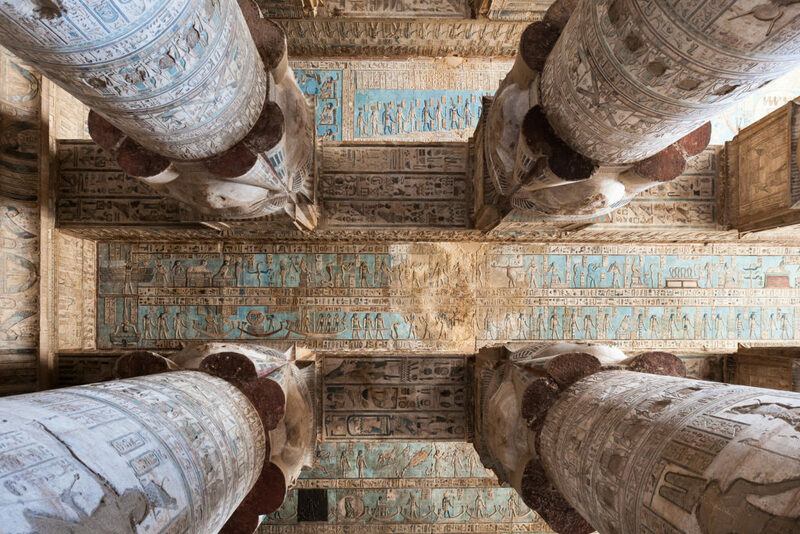 The Priestesses of Hathor are known to be amazing Astrologers (like our own Mary Lomando) and you will benefit by checking the astrological weather this week. Chani Nicholas has wonderful horoscopes for this week of the Full Moon. Or perhaps schedule a reading to see what is happening in your specific chart. Cerridwen is a Goddess that likes to mix it up, literally. 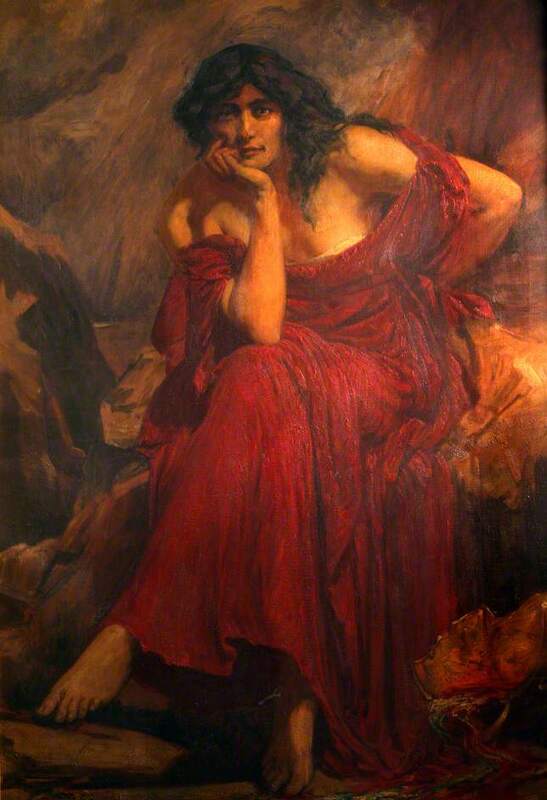 The Welsh Dark Mother is an Enchantress, an Initiator, and the owner of the powerful cauldron Amen. She inspires us to take a sip from the brew of transformation that leads to a complete shift within and without. The areas of our lives that have been ignored or that have become stagnant are the focus of Cerridwen’s offer of renewal. 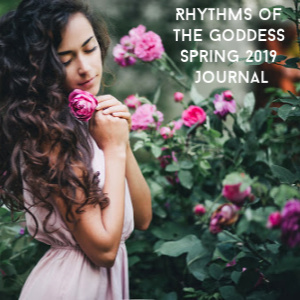 She is the catalyst for inspiration, enlightenment, and evolution into our True Selves and, as happens with initiatory experiences, all of the shadows arise to be cleared. What patterns of behavior are blocking the true expression of your spirit? 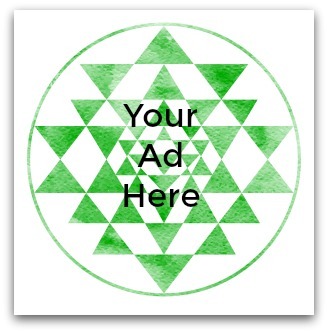 How do you need to shape-shift to become that which you know yourself to be? One sip from the cauldron of transformation will change your world irrevocably. You may not think you are ready, but Cerridwen gives us a knowing smile as She offers a cup of Her potent brew. Spend time in deep meditation during the Full Moon to think about what needs to be released and then burn it in your own cauldron. Offer it up to Cerridwen and perhaps have an herbal brew on hand to toast Her. You are releasing the old and making way for the magic of Cerridwen to take you to the next level. Shungite was the crystal that came to me for Cerridwen … powerful healing and ancient knowledge combined. 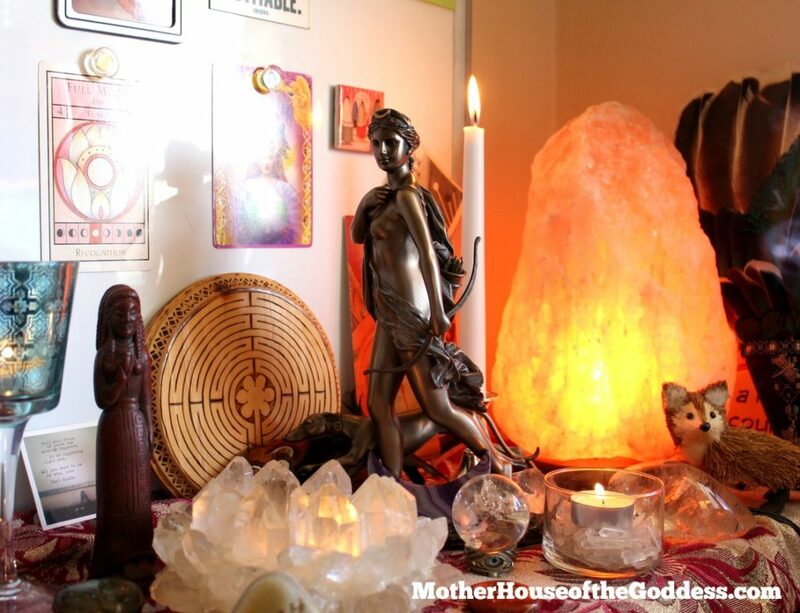 Wishing you blessings of the Goddesses as you move through your week! Such interesting ideas, Kimberly. I am not very familiar with astrology and the “divine” as you present it, but everything of spiritual depth deserves to be explored. Last evening, for the first time in my life, I paid attention to the “energy” of the full moon, instead of just admiring its beauty. There must be something there, because I felt young and powerful! “What are the seeds that you planted at the New Moon? What are the real-world actions that are required to grow those seeds?” This resonants loudly for me right now. Thank you for your insight!